Many will make a big deal out of the new mark, but for long-term investors, it's just another step on the path to prosperity. On Monday, the S&P 500 (SNPINDEX:^GSPC) crossed the 2,000 mark for the first time, drawing huge amounts of attention from media outlets celebrating the staying power of the 5-year-old bull market. Yet despite all the hype about S&P 2,000, events like this are no more than milestones for long-term investors, who recognize that in the context of decades of investing, similar achievements come and go like clockwork. Over time, round-number marks in the S&P 500 and the Dow Jones Industrials (DJINDICES:^DJI) have become much more commonplace, to the point where they almost seem like everyday events. For instance, it took the Dow less than 14 months to cross three different thousand-point barriers for the first time, hitting 15,000 in May 2013, 16,000 last November, and 17,000 early last month. The S&P 500 has climbed at an even faster rate, breaching hundred-point levels along the way: It hit 1,600 for the first time just 15 months ago, 1,700 less than three months after that, 1,800 nine months ago, and 1,900 barely three months ago. It wasn't always like this. For instance, it took the Dow 15 years to rise from 1,000 to 2,000. Similarly, for the S&P 500 to double from 100 to 200, investors had to wait from 1968 to 1985, going through both the big bear market of the mid-1970s as well as the inflation-heavy period of the late 1970s and early 1980s. But the past few years don't mark the first period to see a rapid-fire series of milestones. During the 1990s, stocks soared alongside the technology industry, and the Dow crossed eight successive thousand-point levels in less than five years. Source: Marcy Hargan via Flickr. Now that the S&P 500 has touched the 2,000-point mark, you'll hear endless debate about whether the stock market index will be able to sustain that level and keep rising. You'll hear comments from both sides about whether the market can continue to advance or whether a long-overdue correction will send stocks sliding from their new heights. Much of the discussion will focus on short-term issues and the potential impact of the next big news item on investor sentiment and the major market benchmarks. But the real power of the stock market shows itself not in these milestone events but rather in the inexorable progress that investors make in building wealth. Over the past 50 years, the average annualized return for the S&P 500 has been right around 10%, and money invested back then has grown more than 100-fold in the process. Along the way, investors have had to deal with the inevitable ups and downs of the market, so not all of the money you've invested has earned that 10% figure. If you invested near the top of the market in 2000 or 2007, your returns have looked anemic by comparison, even with the S&P 500 at record highs. If you invested at the bottom of the market in 2009, then you've tripled your money in just over five years, crushing the long-term average. Regardless, the earning power of the S&P 500 has helped millions of investors in their quest to become financially independent. In that light, today's S&P 2,000 mark is worth noting -- just as you might notice when the odometer on your car passes through a big milestone. But when that happens, you don't stop driving. 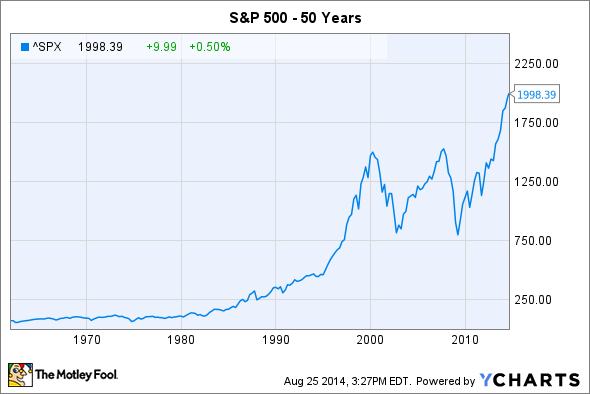 Nor should you stop investing with the S&P at 2,000. Those who stick with the market for the long run will likely see many similar milestones in the future -- even if it's impossible to predict exactly when.